You like playing pretend games. You can use your ideas to make something new. You can show someone something you did by using a picture, model or music. You can remember songs and sing them to other people. You enjoy making models and pictures by using lots of things which look and feel different from each other. You can say how music makes you feel and you can make up a dance that fits that music. You have tried to share what you have imagined with other people by creating something new. You enjoy role-play, songs and making music. You can use them to show how you are feeling. 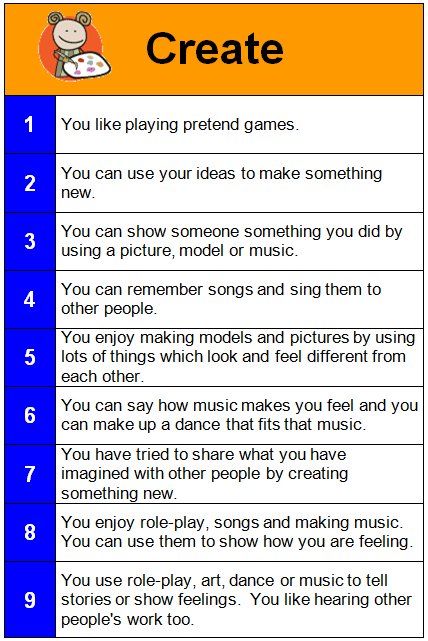 You use role-play, art, dance or music to tell stories or show feelings. You like hearing other people’s work too.